viaLibri ~ Americae pars sexta. Bry, de Theodor, Dietrich (1528 - 1598) Frankfurt a.M. Artist: Bry de Theodor Dietrich ( - 1598) Frankfurt aM; issued in: Frankfurt on Main; date: ca 1594 1528 - - technic: Copper print; - colorit: original colored; - condition: Very good; - size (in cm): 30 x 20; - description: Titlepage from Theodor de Bry, travel to Amercia VI; -vita of the artist: Bry De,Theodorus (1528-1598) Frankfurt a.M. Around 1570, Theodorus de Bry, a Protestant, fled religious persecution south to Strasbourg, along the west bank of the Rhine. In 1577, he moved to Antwerp in the Duchy of Brabant, which was part of the Spanish Netherlands or Southern Netherlands and Low Countries of that time (16th Century), where he further developed and used his skills as a copper engraver. 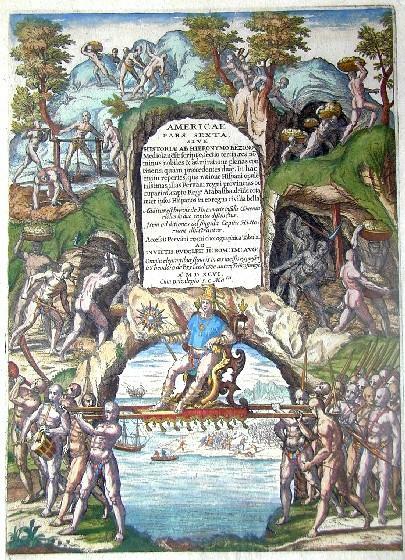 Between 1585 and 1588 he lived in London, where he met the geographer Richard Hakluyt and began to collect stories and illustrations of various European explorations, most notably from Jacques Le Moyne de Morgues.Depiction of Spanish atrocities in the New World, as recounted by Bartolome de las Casas in Narratio Regionum indicarum per Hispanos Quosdam devastatarum verissima.In 1588, Theodorus and his family moved permanently to Frankfurt-am-Main, where he became citizen and began to plan his first publications. The most famous one is known as Les Grands Voyages, i.e., The Great Travels, or The Discovery of America. He also published the largely identical India Orientalis-series, as well as many other illustrated works on a wide range of subjects. His books were published in Latin, and were also translated into German, English and French to reach a wider reading public.